A decent, easy to use machine, but falls a bit short when compared against others in its class. Still a good, low priced home option for the right user though. Recommended for: Novice roasters who are at least a little tech savvy. 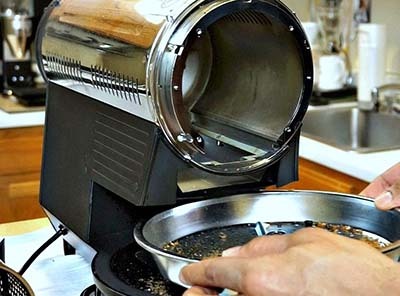 Are you looking for a home coffee roaster that verges on “prosumer” capabilities? One that’s big enough to roast beans in quantity, while still being fairly easy to use? If so, you’re going to be quite intrigued by our Hottop KN-8828b-2k+ review. We’ll be quick to say that it’s not a perfect machine, and it’s not for everyone. It’s a somewhat unusual machine featuring some amazing strengths, paired with some serious drawbacks that might be deal breakers for some users. We’ll take a close look at its pros and cons in the sections below, so you’ve got all the information you need to decide if it’s the right machine for you. Note that Hottop makes three different models. They have more similarities than differences, and we’ll talk about all three in this review. Our rating above is for their flagship and most advanced model, but one of the other two may wind up being a better overall fit for you. At first glance, the Hottop coffee roaster KN 8828p 2k looks a bit like a prop from an older sci-fi movie. It’s not ugly, it’s just got an unusual appearance, and the aesthetic might not be for everyone. It manages to cram a surprising amount of capability in a fairly small footprint, measuring 19” x 14” x 10” and weighing 19.8 pounds, so finding a permanent home for it shouldn’t present much of a challenge for most people, even if you’ve got a smallish kitchen with limited countertop space. Again, the aesthetic of the machine might make it look a little out of place. There’s a lot to like about this model, but for us, the single most attractive feature is the USB port which allows you to connect it to a laptop computer and create detailed, custom roasting profiles. Even better, there are some great open source software options available, including “Roastero/Openroast,” which you can get right here: Github. The community that has grown up around this program is very active and extremely helpful. Even if you don’t know a lot about home roasting when you get the machine, the easy access to people who do have experience will get you up to speed in no time flat. This though is the reason we mentioned in the summary about needing to be at least somewhat tech savvy to get the most out of this model. Using the software is a lot like learning to play chess. 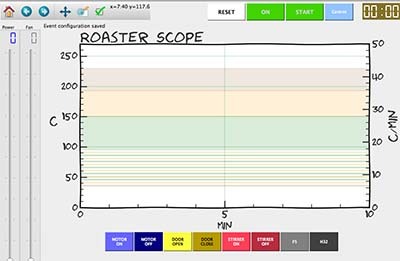 You can learn the basics in a matter of minutes, and that’s certainly enough to get you started, but as you gain more experience building your roasting profiles, you can do some pretty amazing things with this unit. Given its modest price, that’s pure awesome. Even if you opt not to connect the machine to a laptop, you can still maintain full control over the roasting process from the interface on the unit itself, and get complete information about what’s going on via the large, brightly lit LED on the machine’s front face. Our Hottop KN-8828b-2k+ review wouldn’t be complete without paying special attention to the machine’s capacity. Here, it’s strictly middle of the road, with the capability of roasting a half pound of beans at a time. That’s better than many of the models designed strictly for home use, but as we mentioned, this one verges on having prosumer capabilities, and compared to most of the other prosumer models, it winds up lagging in this regard. 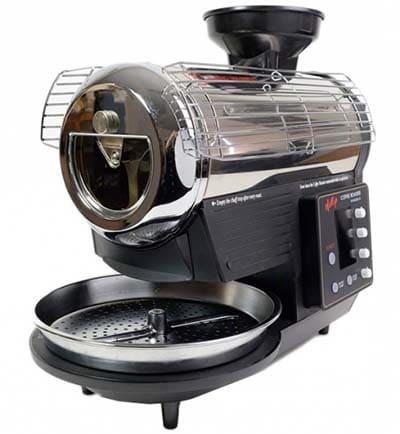 All in all, then, it offers enough capacity to meet the needs of all but the most diehard power drinkers, or those who want to expand their roasting efforts to supply fresh coffee to friends and family, and it does so for an astoundingly low price. Both good things, but certainly not best in class. We gave the flagship model a perfect five-star rating in this dimension, even though the unit doesn’t actually have any built-in presets. The reason is simply that the USB connection and option to create an infinite number of custom roasting profiles via software gives you unlimited potential. Another important aspect of our Hottop KN-8828p-2k review has to do with smoke suppression technology. Unfortunately, here, the model comes up a bit short. It tends to get smoky. Very smoky. If you follow the manufacturer’s recommendation and only use it indoors, then at a minimum, you’re going to want to open all your kitchen windows, turn your stove fan on high, and probably bring another fan into the room for good measure. Even then, you’re almost certain to set your kitchen smoke detector off, so you may as well pull the battery from it as well. Just be sure to remember to put it back in when you’re done roasting! Chaff management is another area where this design falters. Plan on having a significant amount of cleanup as the chaff misses the chaff collection tray, and as you empty the beans into the collection bowl, they’ll wind up making the trip with them, or end up all over your countertop. Unfortunately, you’ll probably also have to put your cooled beans into a colander and sift more chaff out of the beans before you grind them because not all of them will make their way to the collection bowl or your countertop. While it’s true that there’s no such thing as a machine that perfectly collects and separates chaff, it’s also true that some models do a better job than others in this regard. This isn’t one of them. While the roasting is excellent and highly consistent, you will have to contend with more cleanup than a lot of other models. For some people, that’s going to be problematic. 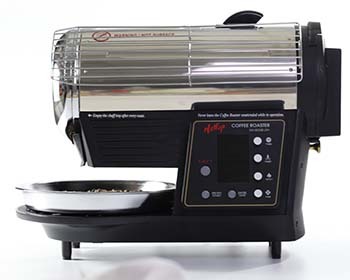 Using the Hottop KN-8828b-2k coffee roaster is fairly simple, although there is a bit of a learning curve, simply because the control panel allows you to tweak so many different settings. The user manual isn’t stellar, but it is good enough to at least get you started. Our recommendation is to keep it close at hand for at least your first few roasts until you get comfortable with the controls. Of course, if you want to take things to the next level and utilize software to create custom profiles, that’s going to inevitably increase the slope of the learning curve, but in that case, you’ve got the community and software user base to rely on for help and expert advice. At a high altitude, using the Hottop is as simple as warming up the beans, inserting them into the drum when prompted to do so, then keeping a close eye on the process through the small but serviceable window and listening for the first and second cracks. The color of your roasting beans and the sound of those two cracks are your key indicators that the beans are nearing completion. The exact roast is, of course, up to you, and depends on what flavors you find most appealing. Once the beans reach the color you’re looking for (actually, about fifteen seconds before they do), it’s time to stop the process and let them cool down. When they’re cool enough to handle, the last step is to sift the remaining chaff from your beans, then do the necessary cleanup to prep for your next batch. Cleaning and maintenance are both fairly simple since so much of the machine is highly visible thanks to the window on the drum. A good rule of thumb is to give it a thorough, gentle cleaning with a non-abrasive cleaner about every fifth roast, but a lot of that is going to depend on how darkly you like to roast your beans. The darker the roast, the more often you’ll find yourself having to clean the unit. Fortunately, it’s easy to detach the guard rails and access the bits that need cleaning, although because there is some disassembly required, it does take a bit of time. The other thing to be aware of when cleaning the device is that it is lightly constructed and of Chinese manufacture, so the quality of the materials and workmanship are a little wanting. If you’re careful, it can still provide you with years of faithful, reliable service, but you’ll want to be mindful of its relative fragility when taking it apart for cleaning because it’s all too easy to bend or break something. As we said at the outset, the Hottop KN 8828b 2k home coffee roaster is a bit of an oddity. Some of the features are fantastic, and others are substandard and will leave you wanting. Ultimately, it depends on exactly what you’re looking for in a roaster. If the model’s main strengths closely align with what your main needs are, you’re going to love it. If its shortcomings are important to you, you’re going to hate it. Tons of flexibility, thanks to the USB connection and the ability to make an infinite number of highly detailed roasting profiles. A half-pound capacity is more than enough for most home users, and even sufficient for some business uses (busy office environments, bed and breakfasts, and the like). Fairly easy to use, provided you are at least a little technical savvy. Produces high quality, very consistent roasts. Produces a ton of smoke. If you use it indoors, you’re all but certain to set off the smoke alarm, which prompts many users to take it to their garage or carport when roasting. Chinese manufacture means that it’s not as high quality as other options you can buy, although this is at least partially offset by the fact that the company does have a good track record of post-sales support. The machine is messy, thanks to relatively poor chaff management. Are the negatives deal breakers for you? If they are, pass on this model. If not, then you’ll find it to be a solid, capable machine, offered at a price that will leave you smiling. As we mentioned at the outset, the company makes two other models, in addition to their flagship product, which we’ve just taken a close look at. These models are identical to the KN-8828B-2k in terms of their construction. Their only differences lie in the control systems used in each. The KN-8828P-2k, for instance, is a much more newbie-friendly machine that requires less in the way of tech savvy to use. It has a pre-programmed roasting profile built into it that’s broken into eight discrete segments which can be interrupted and/or altered at any point, by the user, although the number of modifications possible with this machine are somewhat more limited than on the other models offered for sale. Modifications of the preset profile can be saved and re-used later on the machine’s front face, and up to nine custom profiles can be saved in the machine. 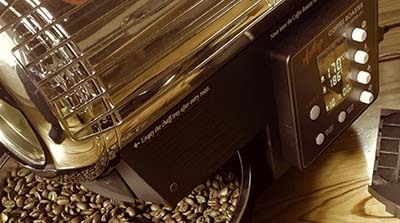 The KN-8828B-2K is kind of a middle of the road machine, giving the user more precise control over the roasting process, and allowing for three custom profiles to be saved for later reuse, but without the USB port that the flagship model offers, which means that ultimately, you’ve got less control over the process than you’d have if you purchased the 2k+. And that wraps up our Hottop KN-8828b-2k+ review. Overall, we like this machine very much, because its key strengths are very much in alignment with what we want in a home roaster, and its negatives, while somewhat annoying, are easy for us to overlook. We realize though, that not everyone will feel that way, so we were fairly conservative with our overall ranking to reflect that. In the final analysis, the real question is, is the Hottop the right model for you? Hottop USA. Official Brand Website. Coffee Roasts Explained. Fontis Water. How to Roast Your Coffee Beans to Perfection. Frog Friendly Wild. Air Vs. Drum Roasting. Copula Coffee.